It’s kind of an anti-Africa movement; this is not right. There is still in the so called ‘old world’ a feeling that ‘why the hell should South Africa organise a World Cup.’ Why the hell? It was easier for them to go down to Africa, the colonialists in the past hundred years, to take out all the best, and now to take out all the best footballers. And when you have to give something back they don’t want to go. What’s that? It is a lack of respect, a lack of respect for the whole of Africa. CAN ’10 — Opening Ceremonies!!! Bem Vindo!!! 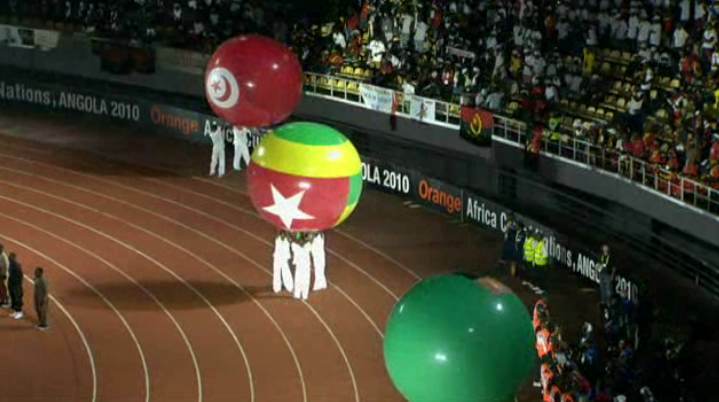 Today is the day…2010 African Cup of Nations is set to kick off! 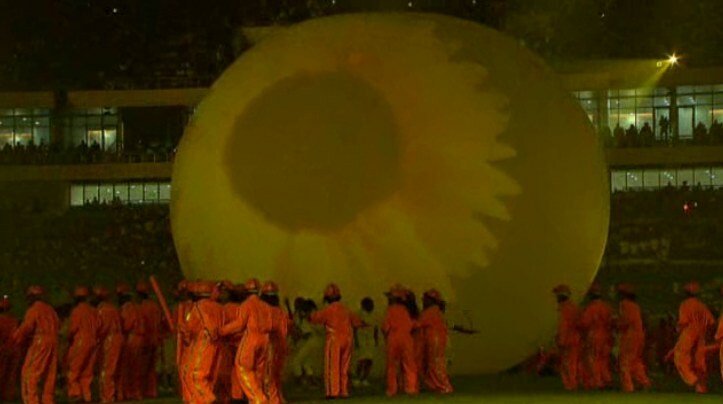 Hosts Angola will get underway against Mali here—but first, some Opening Ceremonies! 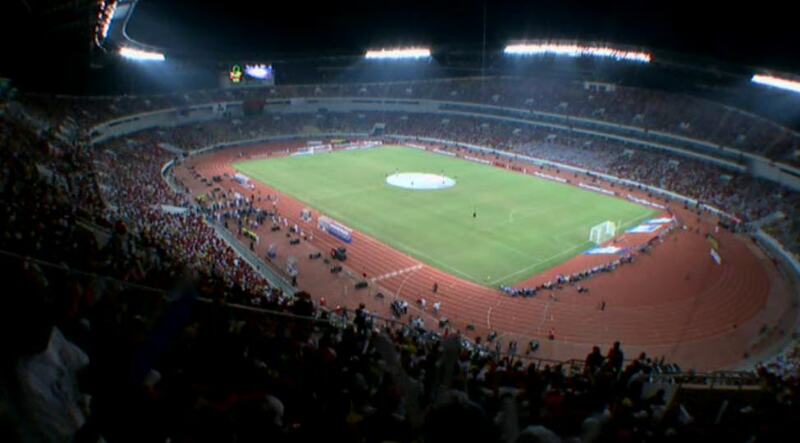 12:50 EST: The inaugural event held in the 11 De Novembro stadium in Luanda is looking fairly well-attended! Angolan Presidnet Jose Eduardo Dos Santos is currently addressing the crowd… nothing political in the speech (no “Cabinda will be brought under control!! !”) though the Togo attack was of course acknowledged. 12:58 EST: The fullblown opening ceremonies spectacle has begun! Apologies for the grainy pics I’ll be bringing you. So far flags and massive national mini-globes are trotted out, and a massive one tarp is out on the pitch, serving as the screen for a light show. 13:15 EST: Wish I had some screen grabs from the independence portion of that interpretative dance show…dancers running around, prominently displaying paper documents, the machete-wielding dancers graaaadually dissipating. We’ve moved into typical fireworks, smoke machine, modest lazer territory here. Screens are now displaying a wealth of Angolan natural resources to be harvested…look at those trabalhador dancers! 13:23 EST: The English announcer I have here on my feed (watching via myafricanfootball.com—since we are now proper journalists we have an online PPV package!) is, as they say in his country, a bit of a muppet (and/or nugget). He has already commented on all the “smiling faces”. Also already expressing concerns about how the opening ceremonies might be affecting the pitch…perhaps a legitimate concern, as this will be the first ever game played on the newly-laid grass. 13:28 EST: Commentator banality watch: “South Africa must be thinking ‘how will we top this opening ceremony? 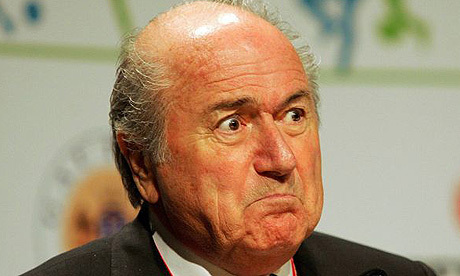 '”—hmmm, perhaps with millions of dollars of FIFA bux and years of planning? 13:33 EST: My Portuguese is pretty crap, but man I love saying nações! Except the lovable Portuguese & Angolans say naçoishhh! 13:40 EST: Opening ceremonies now concluded! Pretty entertaining as these things go…kickoff for Angola-Mali in 20 minutes here and the stadium is looking healthily full, healthfully rowdy vibes are building. I’m likely just going to put my feet up and watch that game, but I will offer some halftime analysis and hopefully images! JA COMENÇA!!! Proceedings are going ahead despite the Togolese bus attack. And Togo, despite earlier reports that they would pull out of the competition, are now saying that they will stay and play. “We are all heartbroken, it is no longer a party, but we want to show our national colours, our values and that we are men,” Thomas Dossevi said. “It was a decision taken nearly unanimously by the team which met during the night after having been reassured by the Angolan authorities,” he added. Alaixys Romao also said the decision had been unanimous. 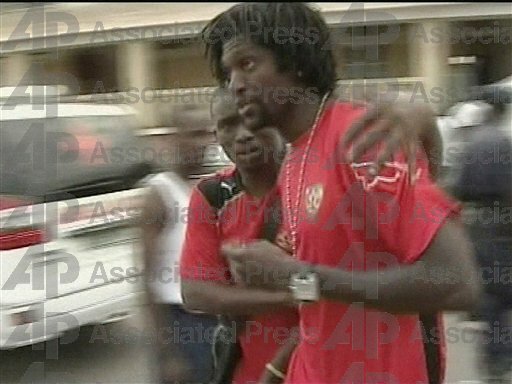 Reports have been conflicting, with Manchester City reporting that Adebayor was already on his way home to Manchester. Hopefully things should be sorted out by tomorrow’s opening ceremonies, but I do hope they’ll decide to stay (if only for selfish desire for added cultural-athletic dramatics). The initial response to the attacks from some European clubs—Portsmouth FC in particular—was pretty shameful. The club with the greatest concerns over security is Portsmouth, which has Nwankwo Kanu with Nigeria, Aruna Dindane with Ivory Coast, and both Nadir Belhadj and Hassan Yebda in the Algeria squad. Portsmouth hoped to take advantage of this awful tragedy in order to get their players sent back to England, not for any worry regarding their safety, but simply in order to bolster their squad for next week’s Premier League games. The manager added: “I don’t believe you can just stop any competition for any incident, because that would be a reward for the people who provoke these atrocities. It would mean any competition could be stopped at any time. The attack on the Togo national team has cast attention on an oft-neglected part of Africa: the region of Cabinda. When Cabindan chiefs signed a treaty with the Portuguese government in 1885, they were deemed a semi-autonomous protectorate that would become known as ‘Portuguese Congo’, and it was not until 1956 that Portugal began to govern Angola & Cabinda together — needless to say, without asking the Cabindans. The gradual administrative merge between Portuguese dictator Salazar’s two “provinces” prompted the creation of the Front for the Liberation of the Cabindan Enclave (FLEC), an independence movement that was to fight not only for liberation from Portugal, but for separation from Angola. Following the 1974 revolution in Portugal, as the Angolan independence movements of the MPLA, the FNLA, and UNITA met with the new Portuguese government to discuss the terms of their independence (which was to quickly devolve into a decades long civil war), no one bothered to invite FLEC along. The political groups of Cabinda refused to recognize the resulting treaty, which included a provision naming Cabinda a province of Angola, and declared themselves independent, which naturally the Angolans then refused to recognize. Despite the end of the civil war in 2002, the conflicts between Cabinda and Angola did not officially end for several more years, when a ceasefire agreement was signed, although the argument can be made that they still have yet to end, as offshoot FLEC groups continue to violently declare their independence. And why does Angola continue to hold on so relentlessly to Cabinda? The same old story: OIL. Oil is Angola’s leading source of revenue, and underdeveloped Cabinda, sometimes referred to as the “Kuwait of Africa”, is the home of more than half of the country’s oil production. Independence then, seems not only unlikely, but impossible. Angolan President José Eduardo dos Santos has already offered to hold a referendum on Cabinda’s independence — or rather, to hold an Angola-wide referendum that would allow 12 million Angolans and 230,000 Cabindans to vote on the matter — an empty gesture indeed. Despite the legitimacy of Cabinda’s claim for autonomy, attacking a bus full of Togolese futebol players & killing innocent civilians has inarguably done more harm than good for their cause. Find further reading here [pdf], here, here, and Part 1 of Portuguese-language documentary Cabinda: Independence or Death here. For reigning champions, Egypt are surprisingly lowly-rated to defend their title in 2010. A recent poll on myafricanfootball.com had 83% of voters anwering “NO” in response to the query, “Can Egypt win for the third time in a row?” This could simply reflect the desire of the sub-Saharan majority to see a sub-Saharan team come away with the cup; but many have also doubted Egypt’s chances following Mohamed Abu Treika’s exclusion from the squad due to injury. Many will be looking to Dortmund striker Mohamed Zidan, one of only two Egypt players who play their club football in Europe [a testament to the economic strength of the Egyptian league, NOT the weakness of the Egyptian squad], to make up for Abu Treika’s absence. 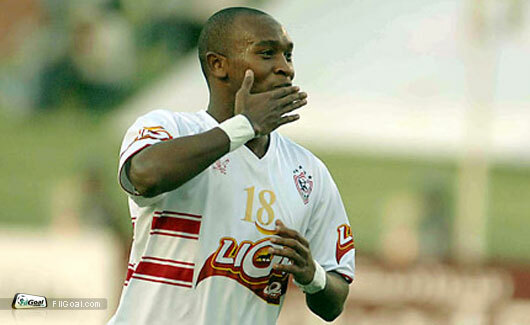 However, the lesser-known Zamalek winger Shikabala may be the surprise star for the Pharaohs this year. At 23, Shikabala has had a rocky start to his career, suffering a one-year ban from the Egypt national team due to “inappropriate behavior” as well as a six-month suspension from club football due to an illegal transfer to Zamalek from PAOK. He’s been in great form lately, however, showing good pace, technique, and a great left-footed shot; he’s also adept at free-kicks. Look to Shikabala to be Egypt’s secret midfield weapon, who may thrive in the absence of Abu Treika. Geddo also apparently found out about being named for the squad while surfing the internet. Having been dumped out of the World Cup by arch-rivals Algeria, Egypt will have an added incentive to make amends with some silverware in Angola, and are surely not to be counted out. Expectations are very, very low for Nigeria’s current team. 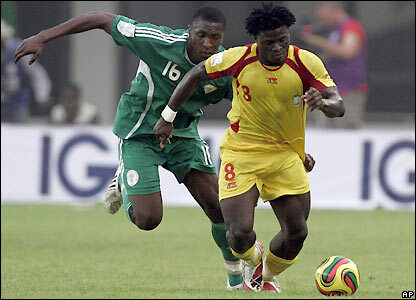 A recent commenter on worldcupblog.org states, simply: “In my estimation, the current team is the worst Nigerian national soccer team I have had the privilege of seeing in my life.” The Super Eagles should be in high spirits after having secured World Cup qualification, although questions may be asked as to why it required a last-minute Obafemi Martins winner against Kenya as well as a simultaneous surprise victory for Mozambique in Tunisia. Dan Ngerem, president of the Athletics Federation of Nigeria, addressed such questions by declaring Nigeria’s qualification a divine miracle: “This is the hand of God, it wasn’t based on our performance. If you look at the whole show from the beginning to the end of the qualification, I can tell you that nobody ever thought the Super Eagles could pick the sole ticket in our group. But God’s way is different from man.” Indeed, and punters who are inclined to take the divine into consideration may do well in backing Nigeria’s chances (which can be got at fairly long odds for such a legendary team). Manager Shaibu Amodu has been openly criticized in the media, with many Nigerians hoping the NFF will bring in someone new before the World Cup. The prolongation of Amodu’s reign will surely depend on Nigeria’s performance in Angola. The Super Eagles lack a real shining star around which their team may be organized, but nevertheless the squad has impressive depth. Yakubu Aiyegbeni, Obafemi Martins, and Peter Odemwingie, if they link up well, could prove to be one of the most prolific strikeforces at the cup. In midfield, Nigerian fans will be looking to Jon Obi Mikel to prove his dedication to the Super Eagles, which is often questioned with seemingly half-hearted performances. At Chelsea Mikel has had periods of excellent form, punctuated by frequent disappointing displays. Mikel seems to typify this Nigeria team, as a semi-star, capable of great skill, but often failing to convince. It will be up to Amodu to prove his worth by bringing out the best in this somewhat formidable collection of players. Nigerian fans can hope the Super Eagles’ appearance at CAN 2010 resembles Greece’s Euro victory in 2004—that is, as a well-organized and competent team that grinds out the results, rather than relying on the flair and brilliance of a few isolated superstars. Also, watch for the Hand of God to make the necessary intervention, like in the case of Nigeria’s WC group-mates Argentina. Nigeria are going into this CAN as a dark horse, and the Super Eagles could use this to their advantage, becoming Angola’s sleeper champs. 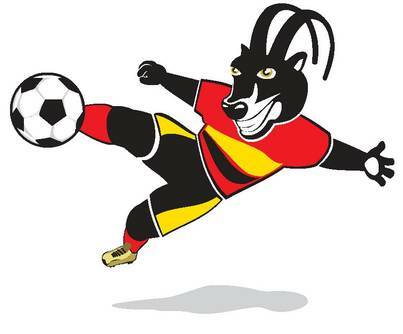 The Mambas of Mozambique come to Angola ranked 98th in the FIFA world rankings, ahead of only Benin and Malawi at the CAN. However, it was the Mambas’ surprise victory against Tunisia that ensured their group-mates Nigeria’s World Cup qualification. Struggling Nigeria will be unlikely to do Mozambique any favors, but such a victory will do good for the southerners’ confidence. Mart Nooij has done superbly well so far as coach, surpassing all expectations, and is held in high favor with the team. Nooij will be looking to continue his success with a strong showing in Angola. Totemic juju-figure (just kidding) and slinky striker Manuel “Tico-Tico” Bucan will captain the Mambas, hoping to inspire his team to a repeat of their surprise success in Tunisia. Many will be watching young defensive midfielder Simão, who currently plays for Panathinaikos, hoping to see sparks of talent that justify his inclusion in Tuttosport’s list of the top 40 young footballers of the world. With several clubs looking to emulate Barcelona’s 4-3-3 formation, many scouts should be watching to see if Simão could be the next Touré Yaya. Right-winger Elias “Dominguês” Pelembe, a slight fellow with great ball control, is also worth watching. Grouped with Nigeria and Egypt, Mozambique’s chances of advancing from the group stage are slim. However, if Mozambique continue their good form, they might be able to capitalize on a slip by either of the two faltering giants, and become the surprise success in Angola. Allez les Ecureuils! The Squirrels of Benin come to Angola to make their third CAN appearance, after an impressive World Cup qualification run in which they narrowly missed out to Ghana, coming in second in their group ahead of Mali. 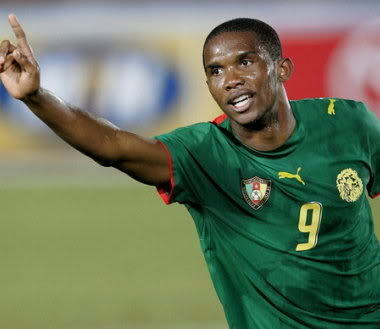 Young striker Mohamed Aoudou scored twice in his only two appearances for the Squirrels during qualifying matches, and looks likely to continue his good form in Angola. 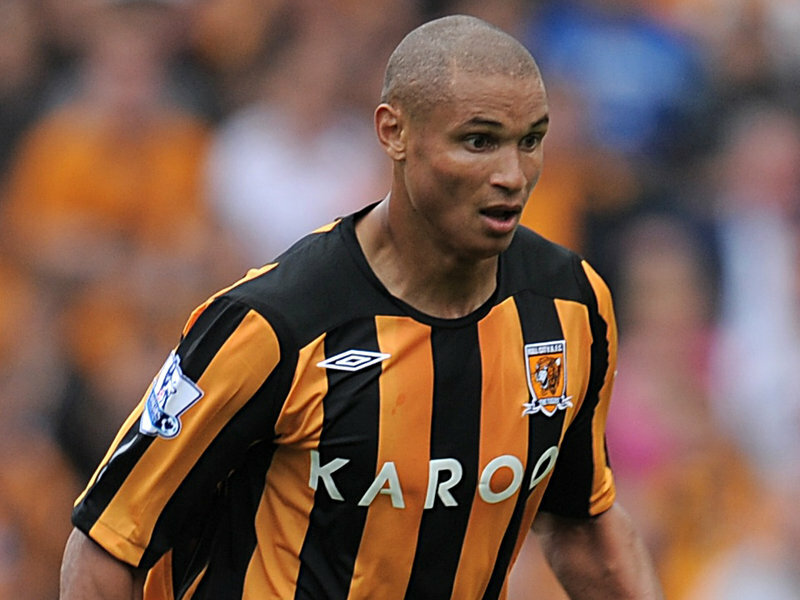 Keep an eye also on Reda Johnson, a 21-year-old central defender who has been in stellar form playing for Plymouth Argyle in the English Championship. Apparently he’s good with a tackle, and adept at passing, which is more than can be said for many top-flight defenders. No one expects Benin to beat out Nigeria, Egypt or high-flying Mozambique for a quarter-final spot, but a convincing display in Angola may establish the Squirrels as a rising African footballing force, no longer to be cursorily written off. Perhaps the tournament’s clear cut favorites, owing to the megawattage of some of their stars. I think I am obliged to type that Africa’s most famous footballer Didier Drogba, is the talismanic leader of both Ivorian line and squad, especially because all Africans are totally obsessed with talismans—indeed Angolan construction contracters have made sure these new stadia come with all sorts of amulets and omen-emitting charms pre-embedded in the pitch. Drogz aside, the offensive firepower also includes his Chelsea teammate Salomon Kalou, Sevilla’s Arouna Koné, 64″ Marseille striker Bakary Koné, and feisty 21 year-old Gervinho (who has scored 11 goals already this year for 2nd-placed Lille in Ligue A). The quality isn’t solely in offense, as The Elephants also feature Barcelona’s leggy box-to-box midfield romper Yaya Touré and Didier Zokora smack in the middle of the park (thriving since moving to Sevilla). The Ivorians look solid right through to defense, with Arsenal’s Emmanuel Eboué at right-back and Kolo Touré in the center. Their weak spot has to be seen as their energetic, though not entirely reliable, goalkeeper Boubacar Barry. Ivory Coast didn’t lose during the qualifying rounds, allowed only 6 goals, and their four draws all came away from home. Hopefully the team is a bit older and wiser than in 2008 when despite a similarly strong field of players and attendant hoopla, they were unceremoniously thumped 4-1 by a more cohesive Egypt team who went on to hoist the Cup themselves. It should also be noted that the luck of the draw pits Bosnian coach Vahid Halilhodzic in a regional-managerial derby against Ghana’s Serbian skipper Milovan Rajevac. The height of Les Etalons Cup glory came in 1998, when as hosts they galloped into the semifinals. The Bukinabé team qualified for the Cup for the first time since 2004, going 9-1-2 in the combined qualifying stages and losing only to Ivory Coast, but they now find themselves in a brutal group…and a newly peculiar one due to the tragedy befalling the Togo squad. 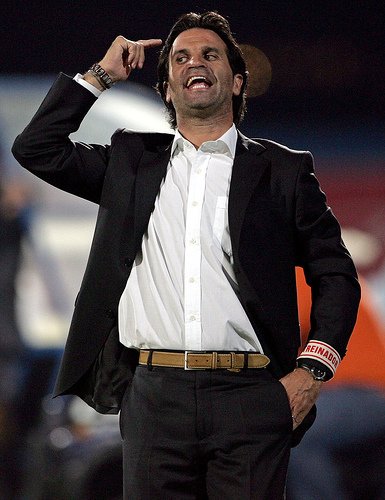 They have been effectively organized by 40 year-old Portuguese coach Paulo Duarte, who was actually Dr. Jose Mourinho‘s assistant in his pre-Porto managerial gig at União de Leiria. With Togo gone from Group B, perhaps his charges can continue to grind out results as they did in the qualifying groups, focusing solely on their showdowns with two giants of African soccer. 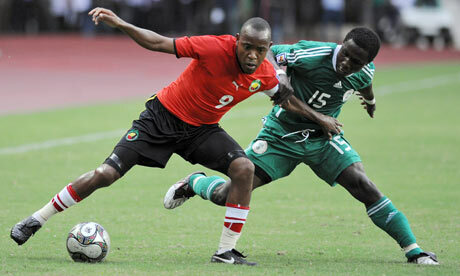 They have already gained valuable experience in their duels with Ivory Coast, one of which was a scrappy 3-2 defeat. If they are underestimated by the sometimes-headstrong Elephants, they will quickly become one of the key narratives of the CAN. The 2008 hosts were favorites to win the Cup before being nudged out 1-0 by Cameroon in the semifinals. Though still featuring the world’s best non-Xavi midfielder Michael Essien (newly back from injury), the Black Stars of Ghana come to the tournament without some influential names. 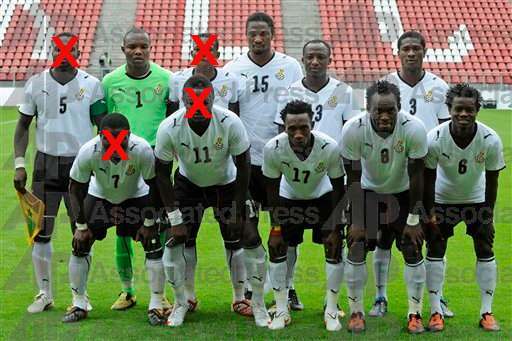 Their defense in particular has taken a serious hit with John Mensah, John Pa(i? )ntsil, and captain Stephen Appiah all missing through injury. Scrappy attacking midfielder Laryea Kings(t? )on is also missing out, as is offensive pivot player Sulley Muntari—he’s not injured, but rather in the doghouse with Ghana’s FA under fishy circumstances. Inter Milan’s Muntari refused to fly down for a friendly with Angola (which Essien and Asamoah Gyan also missed) and is supposedly exiled from the team due to his failure to apologize. Some journalists have insinuated there might be payoffs involved, as major European clubs frequently (and annoyingly) gripe at having to release their players for the mid-season Cup of Nations. The sometimes-delusional hopes of glory biennially fostered by the footballing media in Ghana have earned them comparisons with England. Ghana have traditionally looked a bit thin up front however, although Gyan has bagged 8 goals so far this season for Rennes. They also have the newly enlisted 20 year-old Dominic Adiyiah, on the books of AC Milan, who was voted MVP in the Ghana U-20 teams romp to the World Cup title this summer. Adiyiah is one of eight players promoted from this title-winning youth squad, so perhaps some new leaders will burble forth with so many tradtional totems of the squad absentee. However, even if they score bags of goals, some of Ghana’s finest goal celebration specialists will still be watching from the sidelines, mimicking the choreographed jubilation in sweaty blazers. A STILL-BREAKING news story could see the Togo squad pull out of the tournament after a heavily-armed attack on their team bus. A Portuguese news agency is reporting that splinter groups of the Cabinda regional separatist movement has claimed responsibility for these attacks. Since BOLAS & BANDEIRAS is so newly launched, we don’t yet have the resources to quickly assemble reportage at this level. Togo have withdrawn from the tournament. In addition to the Angolan bus driver slain in the attack, reserve keeper Kossi Agassa has now died as a result of his injuries. One Togo squad member stated that they are “also talking to the other teams in our group to try to convince them to boycott the competition too”. As Adebayor pointed out in his original statement, this is a tragic attack which will confirm many of the worst stereotypes observers have about Africa. We sympathize and respect with the Togo squad’s withdrawal, but think the tournament needs to go on as a positive statement of perseverance…otherwise the “terrorists will have won” etc.! The name most familiar to lily-white European ears is striker Manucho, one time Manchester United signing who is making a bit of a slow start of things in his new gig at Valladolid. 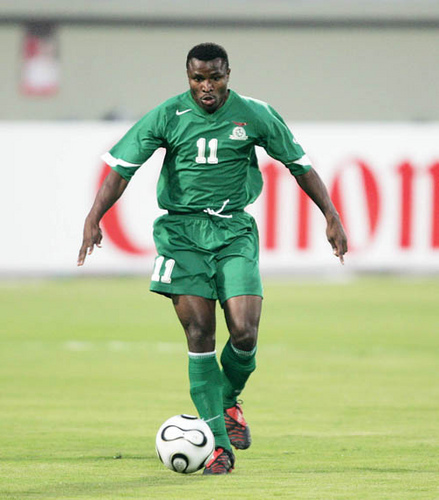 Other notables include Ze Kalanga, another Petro alumnus whose performances in Angola’s shock 2006 World Cup qualification secured him a move abroad to Dinamo Bucharest. As one of those men in the street noted, Angola look good in the ponta da lança AKA man the in the hole department…but elsewhere? Although Mali failed to qualify for the 2010 World Cup, on paper they would appear to be one of the strongest teams here at the cup. 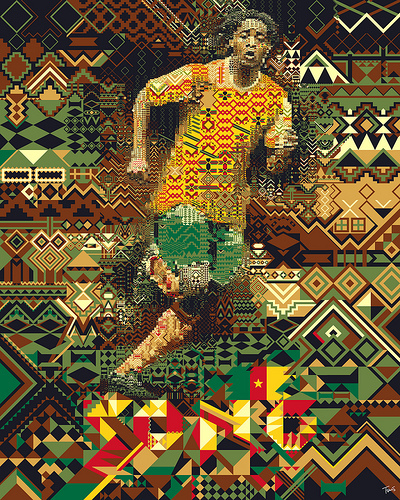 There is a particular wealth of talent to be found in midfield, inlaid with sparkly jewels Mahamadou Diarra (Real Madrid), Momo Sissoko (Juventus), and the more offensively-minded Seydou Keita (Barcelona). Up front they feature Sevilla’s Freddie Kanouté, the 2008 African Footballer of the Year who is pacy, 6’4″, and a business-like finisher. They’re coached by Stephen Keshi, who captained the Nigerian squad in their 1994 World Cup appearance, and whose only management experience came with Togo, who he guided to qualification for the 2006 World Cup. Let’s just say that the Mali team must be strong, composed, and project their talent and experience as firmly as the Wassalou-style chanteuse seen above. What they don’t need is, as below, for Kanouté’s silkly skills to be smothered out by a soundtrack of insidiously pedestrian riffage and whining. This is only the second time Malawi’s Flames have qualified for the CAN, and their hopes don’t look particularly sparkling considering the pedigree of some of their group opponents. In their six qualifying games they managed to not-lose just twice…although these included their sole win against champions Egypt and a 1-1 draw with Ivory Coast. Nearly all of Malawi’s players come either their own domestic league or the lower divisions of South African soccer. Their standout player is most likely Josephy Kamwendo, an attacking midfielder who moved from the Danish league to South African’s Orlando Pirates. Les Fennecs won the 1990 Cup of Nations, but failed to qualify for the last two competitions in 2006 and 2008. They qualified for the ’10 World Cup in dramatic circumstances, dumping out hated rivals Egypt in a playoff. The Desert Foxes have a highly technical team, with several prominent players (read: known in Europe) including Nadir Belhadj (Portsmouth), Hassan Yedba (Benfica/Portsmouth), and Karim Ziani (Wolfsburg). The team looks a bit striker-bereft, relying on goals from 34 year-old Rafik Saifi. They have recently called up the young striker Abdelmalek Ziaya, who has a prolific goal-scoring record in Algerian domestic soccer. Algeria may well be the favorites to get to the quarterfinals after Mali, and an impressive performance here could possibly even throw some buckets on the condescension conflagration in UK and hell even US press—certainly the former and mostly the latter have resisting seeing Algeria as possibly-troublesome groupmates come South Africa this summer. One of many French-born Algerian players to be compared to Z******* Z*****is 25 year-old Mourad Meghni. After spending his youth in a balieue burning things, endlessly practicing his ball skills, and doing parkour style flips off the decaying concrete of failed modernism, he was finally granted bicameral accreditation as a Petit Zidane. He only made his debut for Algeria in August having represented France at youth level (including winning the 2001 U-17 World Cup).